Recent tax related scandals, such as the release of the Panama and Paradise Papers, have led to a public debate around the world and a growing demand from investors, civil society, media and governments for more information on how companies approach taxes. To address this information need, the Global Sustainability Standards Board (GSSB), GRI’s independent standard-setting body, earlier this year launched a project to consider creating a new reporting standard aimed at promoting greater transparency around a company’s approach to taxes. Today it has published the draft standard for public comment. The current state of public tax reporting leaves much to be desired. A recent study by RobecoSAM indicated that only 17% out of 830 companies surveyed were reporting publicly on tax payments at a country level, and most of these were only operating in a single country. This number is anticipated to increase significantly. 80% of respondents in a recent OECD Base Erosion and Profit Shifting (BEPS) survey by Deloitte, targeting tax and finance managers and executives from multinational companies in 38 countries, said they expect public country-by-country reporting to be adopted globally in the next few years. 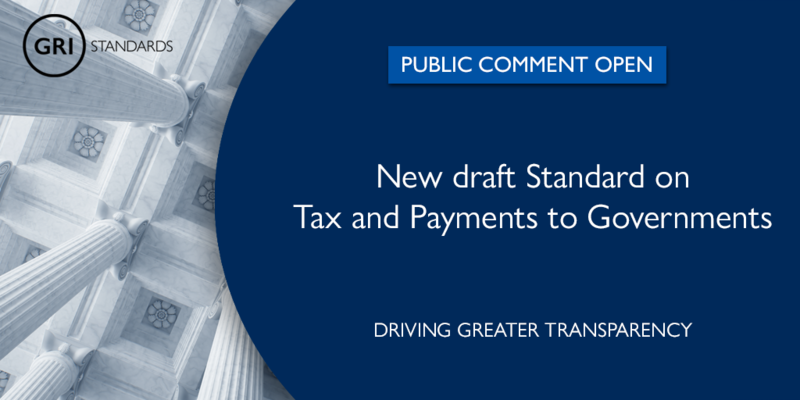 GRI’s proposed tax standard aims to take a major step towards enabling such reporting by setting out common, well defined disclosures related to tax strategy, governance, control, risk, and stakeholder engagement, as well as country-by-country reporting of income, tax, and business activities. “As the global standard-setter for ESG reporting, GRI is uniquely positioned for this pioneering work. The multi-stakeholder approach led by GRI’s independent Global Sustainability Standards Board allows a consensus position on transparency to be developed through the collaboration of all relevant stakeholder groups, exclusively in the public interest. This approach guarantees a globally acceptable standard that enables vital societal dialogue to address global sustainability challenges. We invite all interested stakeholders to engage during the upcoming public comment,” Kuszewski adds.